“Wake up people! Find your behind and sit on it,” Captain Adam yelled over the roar of the monster wave spilling into a 20-foot hole- dead ahead. Lava Falls is the most fearsome rapids on the 227-mile Grand Canyon run. I bolted from my day-dreaming position on the warm pontoon. While drifting between walls of black porous rock once inside the cone of a volcano, I’d sunk into river time. When we floated past the enormous basalt plug in the middle of the river, I’d forgotten that it meant we were approaching Lava Falls and that I was holding a one-way ticket home. The enormous wave cascading over the lip of rock was begging to catch a boatman in a mistake. I saw water spitting from the churning brew as we headed for the maelstrom. I held onto the straps for all I was worth and prayed I wouldn’t get washed off the raft. A thrashing bull ride later, it was over leaving us clapping and laughing as we rocked and rolled through the rest of the wave train. When Georgie White ran Lava prior to the installation of Glen Canyon in 1964, the volume of water was often five times what we experienced. Upsets were the norm and many rafters had the swim of their life. 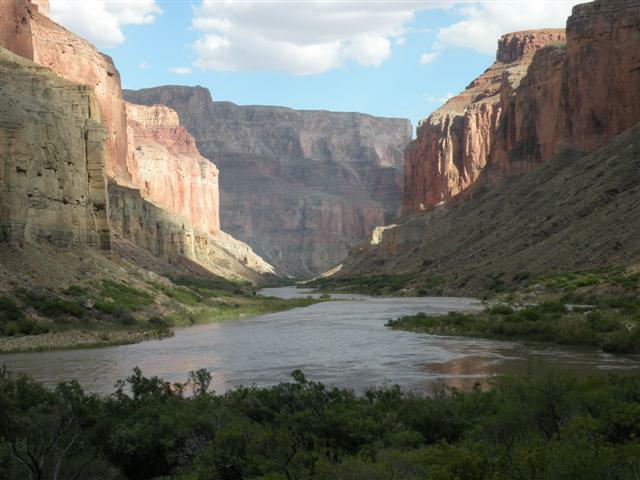 In 1869 when John Wesley Powell led the first recorded run of the Grand Canyon, he portaged supplies and had his men line their wooden boats downstream past Lava Falls. 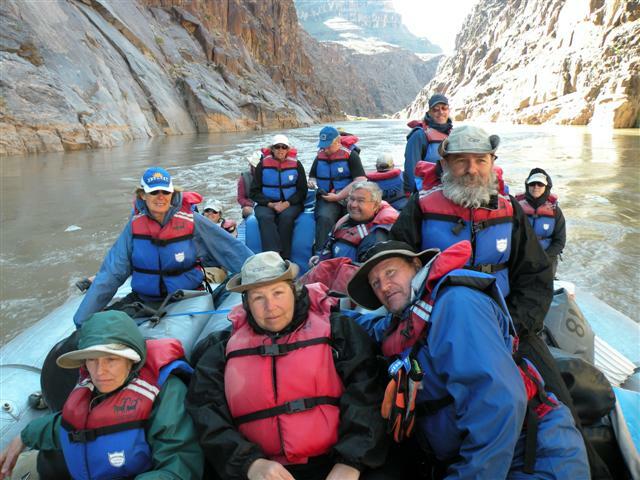 In the 1940s, Georgie not only rafted the entire run through the canyon solo twenty times, she actually swam through the over 100 rapids on the run in a life vest. The “Woman of the River” as she liked to call herself, admitted that the rapids were her first love. But, the peace she felt in the Grand Canyon when she rafted the entire 280 miles in 21 days without seeing another human being called her back over and over again. The continuum of nature counter-balanced her life of selling real estate in Los Angeles in the winters. 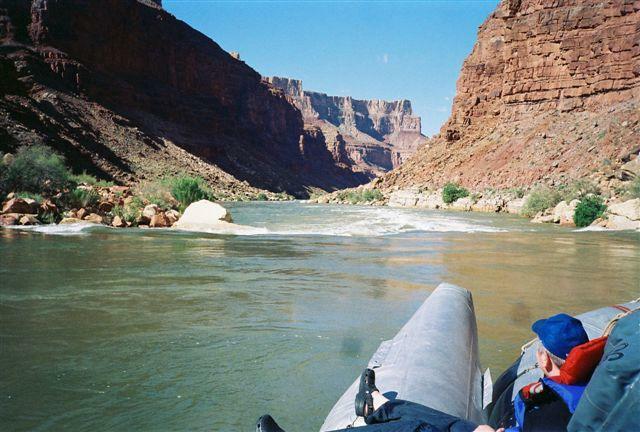 The 37-foot raft with pontoons on each side used by Grand Canyon Expeditions is steered by a guide at the motor arm of an outboard. It’s called a G-rig named after Georgie. She was the first to strap three rafts together to create a craft buoyant enough to handle everything the river had to offer. It allowed anyone with a spirit of adventure to take this journey with her through deep time. When I climbed aboard our raft at Lee’s Ferry with twelve other passengers, the river was aquamarine. When Georgie ran the river before the installation of the dam, the river ran red from sediments and warmed to 70 degrees in the summer. Today the water released from the bottom of the dam is a chilly 55 degrees requiring travelers to wear rain suits that Georgie would have found silly. When she started commercial runs in the ’50s, she always took her guests on the steep hike up to the granaries carved into the cliffs by the Puebloan people in 1100AD at Nankoweap. We camped on the delta below and made the same stair-stepper climb. The storage rooms for corn grown by the native people are impressive, but the sweeping vista of the pumpkin coliseum cupping the coffee-brown Colorado winding its way to the Gulf of Mexico is mystical. At dusk the setting sun warms the canyon walls to a rosy glow as though shining through a stained glass window. 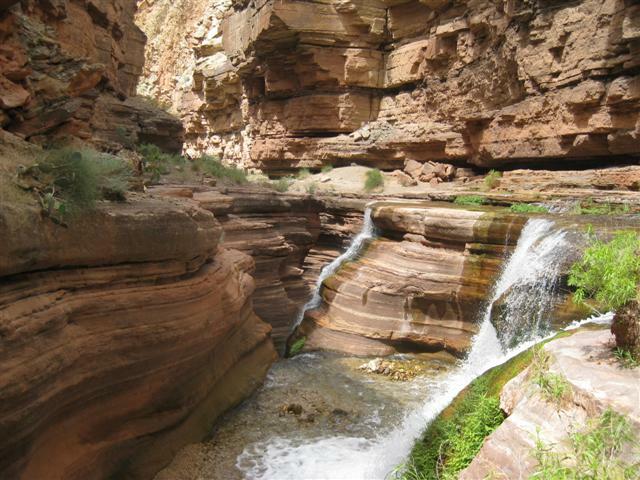 Deer Creek, a blaze of white water cascading 100 feet out of a polished red rock, has carved a sinuous gorge that can only be explored on foot. The stiff climb up to a flat rock ledge tracing this deep cleft in the canyon opens to an Eden-like paradise shaded by emerald green cottonwood trees. The Paiutes hold this site high as it is the jumping off place for spirits into the afterlife. The chatter of Deer Creek that continues to sculpt the snaking sandstone gorge is all that is heard in this sacred chamber. Georgie was happy with a tin of tomatoes in her backpack for sustenance. She found that a vegetarian diet gave her boundless energy. Contrary to her Spartan ways, we enjoyed meals of grilled halibut, chicken, and tender filet mignon with a variety of wholesome salads and side dishes. Every night Captain Adam and Chelsea, his assistant guide, served us cake warm from a Dutch oven. Breakfasts were blueberry muffins, French toast, yogurt, egg sandwiches, fruit, cereals, sausages and cowboy coffee. Days on the river seem to collide into one another. Some people wore watches, but I couldn’t understand why. We chatted in the cool mornings over coffee while the sun peeked over the rim illuminating the canyon walls that protected us from any news from outside. Now part of the natural rhythms of the canyon, we awoke at first light and were in bed when the sun dipped down behind the rim after a full day of rafting and hiking. I slept under blinking stars with a light warm breeze on my cheek and no mosquitoes to ruin the spell. The only flying insects were gnats that were dinner for the hundreds of bats that flickered between me and a brilliant full moon. I envied Georgie her time alone here. Her words rang in my ears. “Once you enter the world of that canyon on the Colorado River you are completely alone.” I did have a few moments to myself at Stone Canyon where a bubbling flow tumbles over a rim of a red rock framed in maidenhair ferns and green mosses. My skin was dry from the alkaline-rich waters of the Little Colorado where we had giggled down a water slide earlier that day. I tore off my clothes and stood under the tingling spray that made me think about the power of water. The element that in six million years sculpted this canyon a mile below the rim of the Colorado Plateau, unearthing basement rock that is 1.7 billion years old, is the same element that gives life to us all. I sat before this lovely little waterfall and gave thanks to Earth Mother. Each day on the river brought new wonders. Day one we motored through serene stretches of sandstone pharaohs, sphinx, and thunder birds. I saw Kokopeli, the randy prankster of the Southwest, who led many an Indian maid astray with his magic flute. A burst of white spewing from polished red rock called Vasey’s Falls seemed a miracle after miles of arid monoliths. Upper Granite Gorge on day two-or was it three-is a fun 40 miles of roller coaster rapids with big waves splashing over our bow. 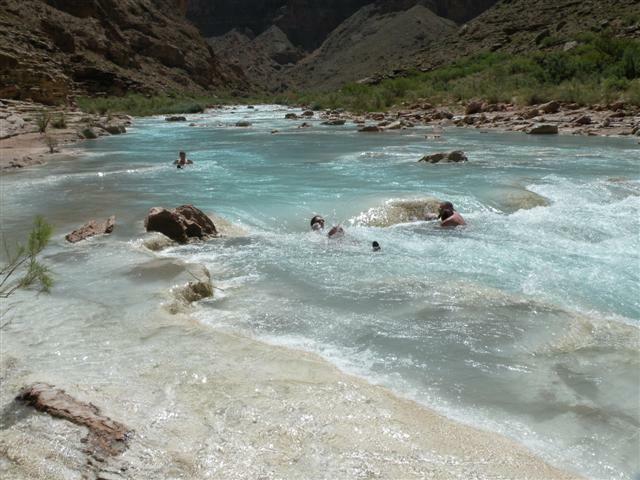 Where the opalescent waters of the Little Colorado merge with the now murky Colorado marks the end of Marble Canyon and the beginning of the Grand. Vistas widen, temples rise, cathedral buttes now olive green with sage-covered shoulders stippled with barrel cactus spread to the rim 10 miles away. Mysterious slot canyons carved by creeks merging with the main vein beg to be explored. Caverns in the river wall streaked with black and white designs bring to mind the pottery of the Native Americans who have long made this canyon their home. Clouds of teal-backed swallows and black and white swifts do fast flight maneuvers about our heads. Herons on the shore stand like sticks hoping to be ignored. A mountain sheep stares at us with dull recognition as we glide by his shore. It’s just another day on the river and each day there is more. 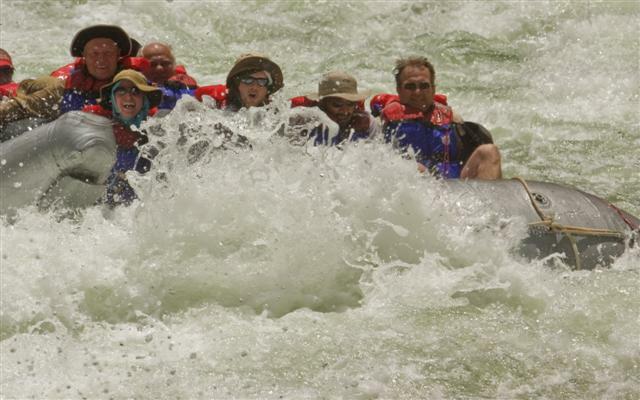 I kept asking myself why was it so important for me to raft in the wake of Georgie White? Is it because I too sell real estate in Los Angeles and need to reach for the freedom demanded by a wild spirit? Chelsea, a full-fledge boatwoman who takes guests down the river in an oar boat, told me the river was like a relative she has to come back and visit each year. 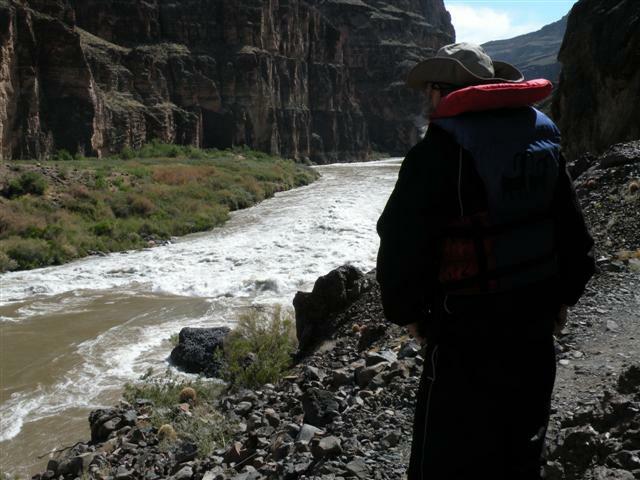 She needs to see how the river has changed the beaches and churned up the rapids, and to feel the embrace of the canyon once more. I loved going with the flow of the strong current carrying us into unbroken time. I felt vitally alive living in the present watching for signs of what was to come-shifting clouds, rising winds, whirling eddies, sounds of rapids looming ahead. I felt a powerful jolt of energy while doing my mediations. It’s an energy that Adam says can steal your soul. An Indian friend told Adam he must call his soul back from the river at the end of each season lest it be tempted to stay during unforgiving winters. Like the Woman of the River and all the brave women who paddle in her wake, he too is captive to the charms of the canyon.